Jody Pountain lives compactly aboard a 42′ sailboat with her boyfriend Peter and their dog, Betsy. She traded in the corporate conundrum for a life less ordinary and has been island-hopping around the Caribbean ever since. 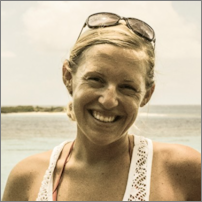 Between a quirky obsession with organizing, capturing pretty pictures, diving with turtles and burying her toes in the sand, she feeds a passion for writing by blogging about their adventures in search of surf, sun, sand and serenity Where The Coconuts Grow.